This 3m x 3m Waltons Insulated Garden Room offers a modern and stylish building that is both practical and comfortable. 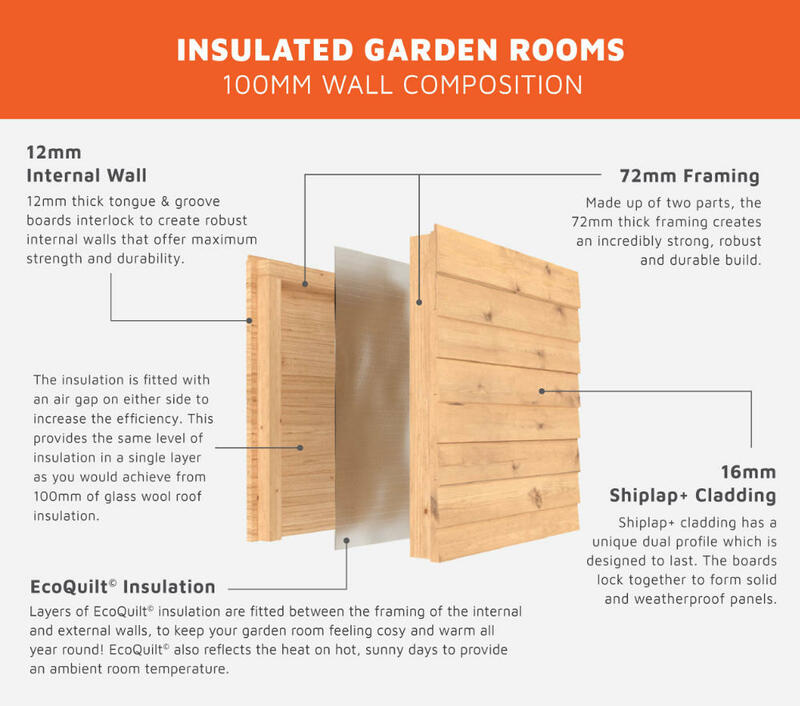 The building is completely modular, meaning that you can position the panels of the building to your specification, moving windows and walls to give you your perfect garden room. The windows of this garden room are double glazed to keep as much warmth inside as possible, with two of the glazed panels including opening top windows. Spotlights have been fitted into the roof overhang to illuminate the front of your garden room at night. Please Note: The price of this item includes full installation of the building into your garden. A firm and level base is required for this, either made of solid concrete or concrete slabs. It is recommended that the floor of this garden room is further covered by either carpet or laminate to reduce wear on the match boards. "This building makes a fabulous home office. We've had electricity installed and my desk and office furniture fits perfectly. The building is very substantial and the wood looks superb. The windows and doors seem to be really well built. We've painted it a lovely grey colour - very happy with my new purchase." Review:This building makes a fabulous home office. We've had electricity installed and my desk and office furniture fits perfectly. The building is very substantial and the wood looks superb. The windows and doors seem to be really well built. We've painted it a lovely grey colour - very happy with my new purchase. I am delighted to know that you are so happy with the quality and appearance of your garden room. It is always so lovely to hear from happy customers and I thank you again for taking the time to provide us with your wonderful review!